Hello everyone! Hola a todos!! 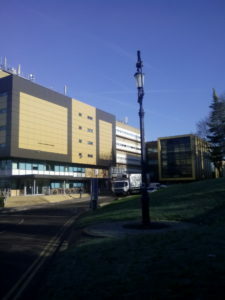 I wanted to share with you a few pictures I took of the university campus today because it is such a beautiful winter day at the University of Surrey. You see I love blue skies and coming form South America, I grew up hearing how the weather in the UK is terrible because it rains a lot and it is always cold and grey. When I decided to come to the UK to do my Masters I bought a lot of winter clothes and I was ready to embrace the grey, sad, rainy weather. But let me tell you that since September, when I arrived to Surrey, I only used my umbrella three times, and it only snowed once this far. I do come from a cold city, La Paz, Bolivia. A high city in the Andes so I am used to the cold. But it does not mean I like grey and rainy, so Guildford surprised me with its wonderful weather. I did not have to worry about rainy too much or grey or sad at all! If you are coming from a valley or a tropical city then do not worry, the winter is not as terrible here as in other places in the the north of the UK or Europe. This is the view from my own room! It is a beautiful view and even better with the blue sky. This is the view from the Admissions and Recruitment’s office. It overlooks the lake. 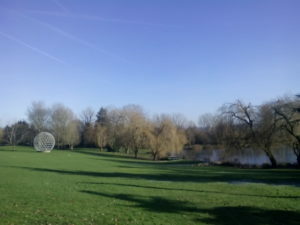 This is the view of the lake in a beautiful winter day. In this picture you can see the library! 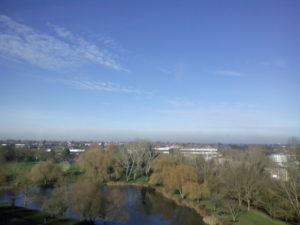 It is cold but beautiful when it is sunny and here at Surrey it has been mostly sunny! 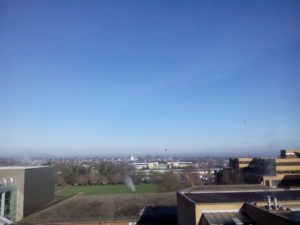 So coming from south America you do not have to be afraid of the weather or the snow of the UK, you can be sure that by being at Surrey you will have a wonderful time even in the winter!